A reading from the gospel of Mark 6:30-34 and 53-56. Earlier in the story, Jesus had sent out his disciples, charging them to carry out his healing ministry wherever they went. Upon their return, we hear this. Listen for God’s word to us. We have one more reading today. It is from Revelation 3:14-18, 20, 22. Listen. Human need dominates the stories presented today in the gospel of Mark. Everywhere Jesus goes; the sick, the lame, the chronically incurable are placed upon his path. The verses from the gospel of Mark that we heard today aren’t as exciting as the ones skipped over by the assigned lectionary text. Between the disciples of Jesus returning to him and those in need pressing round him no matter where he goes; we miss the miracle of Jesus feeding 5,000 hungry men plus women and children, and Jesus amazingly walking over the water of the Sea of Galilee to catch back up with his disciples after he sent them on ahead, dismissed the fed-crowd, then went up the mountain alone to pray. Those might have made better stories for today – awing us with five thousand plus fed from five little loaves and two little fish. Boggling our minds at the sight of Jesus striding across tumultuous water until finally getting into his disciple’s boat. Instead we’re left to ponder what seems like transitional verses. Hastily put before us. Reeking of human need. He should have known he was walking into a hornet’s nest of need. One biblical commentator reminds that “the town of Gennesaret was located on the western shore of the Sea of Galilee, between Magdala and Capernaum, where numerous hot mineral springs had attracted the sick and injured for centuries” (Robert A. Bryant, Feasting on the Word, Year B, Vol. 3, p. 265). As one who has been about the land healing in word and deed, Jesus should have known he’d be swarmed by human need the moment he set foot out of the boat. He just had landed in a town of last resort. Like emergency rooms today, those whose bodies would not get well on their own flocked to the magical mineral springs. When all else fails, we’ll try just about anything. The misery of human pain, the weariness of chronic illness, the hopeless out-of-control feelings of our bodies not working the way we want them to can open us to whatever healing we might be able to find. . . . People from all over Galilee are brought near Jesus – everywhere he goes. The gospel records that they “begged him that they might touch even the fringe of his cloak; and all who touched it were healed” (Mark 6:56). Which reminds us that no matter how bad the news is today; human need is nothing new. With the goodness of a committed shepherd, God in Christ still looks upon our need with compassion. All our needs – at least according to the gospel of Mark. Though it may be the most recognizable, physical illness is not the only human need addressed by Jesus. The gospel of Mark records that when Jesus’ disciples return from their ministry adventures, Jesus whisks them away to a deserted place. He wants them to rest; for, as the gospel records, “many were coming and going, and they had no leisure even to eat” (Mark 6:30). A wise leader, the disciple’s Lord can see the need in them – the ones who had been sent out to heal human needs. They only can be out there at it so long until they must take a break. Rest. Re-fill. Refresh so they might journey on. Which hopefully is exactly what we experience when we gather here. To worship. To be re-filled by God in order to go back out to serve a world full of immense human need. . . . In the 20th Century, the American psychologist Abraham Maslow proposed that all humans have needs which, in fact, are hierarchical. We’d do well to remember – especially as we seek to serve God by serving others faithfully each day. Maslow explained that if our physiological needs for food, drink, and sleep are not met; it is not possible for our basic needs for safety, shelter, and stability to be met. Our social needs for being loved, for belonging, and for feeling included somewhere; must be met before our ego needs of self-esteem and personal power ever will feel complete. And all four of these – what Maslow called deficiency needs because we will feel deficient in some way if these are not met – our deficiency physical, security, social, and ego needs must be attended before we ever are able to reach for our own self-actualization – our fullest potential as human beings who can grow and create and develop. Even the great philosopher Aristotle believed that “no one can philosophize on an empty stomach!” (see https://www.google.com/amp/s/www.psychologytoday.com/us/blog/hide-and-seek/201205/our-hierarchy-needs%3famp). Jesus’ disciples were filled with their own human needs. Beautifully, Jesus ensures those needs also are addressed. Which makes it a little confusing why so often as God’s people, the church, we fail to admit our needs. All of our needs, not just the obvious ones everyone with two eyes easily can see! . . . I once knew a family – a beautiful, picture perfect church family with whom I closely worked in a whole variety of church ministries for about a decade. I’d been to their home on a number of occasions. Was present at the birth of all four of their children. Watched them grow for almost ten years. One night, several years after I no longer was their pastor, I bumped into the mom unexpectedly. The next night, I received a late-night frantic call from her. She bashfully explained that after years of watching her beloved husband drink himself into a messy, depressed stupor each night; the man suddenly had gone missing that very night. She didn’t know where else to turn; so, in desperation, she called to see if I might be able to help. Perhaps that family routinely brought their households needs to God. But never once in their ten years of perfect-looking membership in the church where I met them, never had they EVER brought their broken, chaotic family needs to me or any other person of that church. Had the crisis of that night never happened, I’m certain they never would have. The words of one biblical commentator bellow what seems to be true. She writes: “Most people in Western Christianity see the story of their life as a self-sufficient text. This text may intersect with others, but for the most part it reveals a narrative that is self-contained, self-grounded, and self-made” (Cheryl Bridges Johns, Feasting on the Word, Year B, Vol. 3, p. 261). A picture-perfect public face behind which we all try to hide. Like it or not, we all have human needs. The true knowledge of who we are physically, emotionally, mentally, and spiritually beneath the surface of the public images we seek to continue. . . . I am NOT suggesting we have a big cry-fest to let it all come tumbling out before each other. I’m not proposing a pass-the-mic-around-the-room tell-all that reveals every last need in each of us. That likely would do more individual harm than good. We do each need at least one person on earth with whom we safely can tell our truth so that we can continue to function well. And we need to know that with God, we never need to hide behind our public face. In fact, with a whole host of older and wiser spiritual teachers; I would argue that if we try to approach God behind our public face, all of our striving will be empty. For, in the words of that same commentator just quoted: “the meeting of human hunger and the outstretched hands of Jesus create the possibilities for miracles of grace” (Ibid., p. 265). 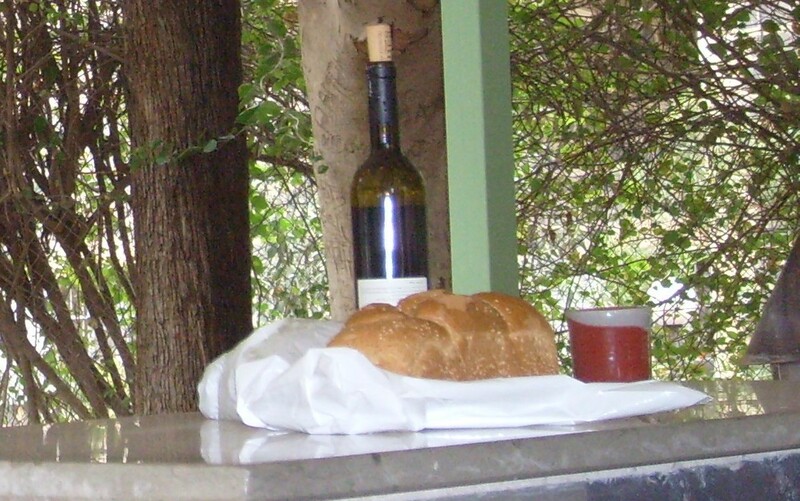 He will provide the bread we need; for he IS the Bread of Life. The true food that can satisfy all our need. For our part, in our life with one another: at least we might bring to mind our own needs, so that we can remember that everyone else too is carrying a load. Needs we never may know of one another. But needs among which we might gently walk. Extending grace. Showing compassion. Trusting Christ to provide all we each need for the journey home. For, as the words of Revelation remind – the words of Christ to us: “I am standing at the door, knocking; if you hear my voice and open the door, I will come in to you and eat with you, and you with me” (Rev. 3:20). Mysteriously. Miraculously Christ will meet our needs. “Let anyone who has an ear listen to what the Spirit is saying to the church” (Rev. 3:22). This entry was posted in Sermons and tagged 22 July 2018 sermon, Abraham Maslow, Basic Human Needs, Deficiency Needs, Extending Grace, Gennesaret, Hierarchy of Needs, Human Need, Mark 6:30-34 and 53-56, Mineral Springs of Gennesaret, Public Face, Revelation 3:14-22, Walking Gently on July 23, 2018 by RevJule. A reading from the gospel of Mark 6:6b-16. Remember this takes place right after Jesus has been rejected in his hometown. Listen for God’s word to us. I once read about a Christian woman who is a clerk at a bookstore. Every morning she gets herself up out of bed, says a little prayer, makes sure she puts on the precious cross necklace her mother gave her years back for her confirmation; then dutifully heads out her door to the bookshop. Every day, week after week, month after month, year after year this is what she does. She still is a part of the church – goes to worship every Sunday she can, when her boss doesn’t schedule her for the Sunday morning rush. Their bookstore, after all, has a wonderful, jam-packed-on-Sunday-morning café. . . . Well, the story goes that one morning as she is getting all set behind the bookstore counter, she looks up to see an oddly dressed man. He’s a Hasidic Jew – these are the ultra-orthodox Jews who take great delight in observing God’s commandments (www.judaism.about.com). Their clothing sets them apart. The men wear long black coats over white shirts, black pants, and black shoes. You can see the knotted fringe peeking out on all four corners of a vest-like garment called a tallit. Under their tall black hats, you’ll always find a yarmulke which reminds that God is constantly above them (www.mobile.dudamobile.com/site/orthodox-jews/clothing-for-men). On that morning at the bookstore counter, the man intently looked into the eyes of the Christian book clerk. After politely asking if she could help him, the man responded: “I want to know about Jesus.” Another one for the religious section, the woman thought. She said: “You’ll find the books on religion upstairs on the far back wall of the store.” She was about to go on to her next task when the man leaned in closer. “I don’t want a book,” the man said. “Please: tell me what you believe.” (Story from Feasting on the Word, Yr. B, Vol. 3, p. 216, Michael L. Lindvall). Those first disciples didn’t get a chance to think about it. After witnessing with their own eyes the unbelief of Jesus’ hometown, he gathers them up. Pairing them two-by-two in a way that sounds reminiscent of the animals of Noah’s ark, Jesus sends them out. We’re never really told where he tells them to go. And we’re not really sure how long they go away. He is very clear about the way they should dress – simply, traveling light so that they have to depend upon the kind of hospitality expected throughout the land of God’s chosen people. Perhaps they’d be known in the little villages to which they’d travel. After all, Galilee isn’t too terribly big and Jesus already has been out teaching, healing, and meeting those who were hungry to hear. One biblical commentator says of this mission that they, like us, aren’t sent “’to get them on our side’ or even ‘to grow the church,’ but simply to tell others about the God who has come to mean so much to us” . . . From the heart, Jesus sends us out to speak. In our own words, without any sense of shame (Feasting on the Word, Yr. B, Vol. 3, p. 216, Michael L. Lindvall). . . . The tricky thing is that it’s not just words these disciples are sent to do. Actions are to go along with what they say. They’ve been given the power to be about healing in this world. Acting in ways that bring peace and hope and restoration to those in need. It’s words and actions, actions and words congruent with Christ that give powerful witness. One without the other is empty and will fall on deaf ears. . . . The legend about the great Hindu peace-seeker Mahatma Ghandi reminds of that. For it’s attributed to Ghandi that he once claimed that he’d consider becoming a Christian if he ever met a follower of Christ who truly was seeking to emulate Christ each day. It’s still like that. To begin with, we’re still sent. I know it’s easier to relegate Christ’s mission to his first disciples. In days gone by the church believed it was just foreign missionaries or ordained pastors who were to be out there for Christ each day. I’m not really sure how we came to such conclusions in the past few centuries, but it certainly seems we did. One of the hallmarks of the Protestant Reformation is the priesthood of all believers. This was the Protestant revolt that proudly claimed that every Christian, in our baptism and confirmation vows has promised to be a faithful disciple of Christ. We’ve all promised to be in the world as one who follows Christ – not just priests upon whom the Pope’s favor rests. We ALL are to live as those in whom the ways of Christ can be seen. We’ve promised to live each day in a way that shows the merciful love of God. In our baptisms we’ve been engrafted into the body of Christ – we’ve been included in God’s family not alone for our own sake, but also for the sake of everyone we meet in this world who too needs to experience (through us) the gracious love of God. How ever did life in the church become the norm of walling ourselves in our sanctuaries to dutifully perform all sorts of ministry programs for ourselves and others like us who might come to darken our doors? I have a feeling God might be glad those kind of days are coming to an end. Because today we see it in our own families, in our neighborhoods, and all over our city. People are starving for meaning in their lives – some of them are aware of it and some of them are not. For about the past ten years, research has shown that the fastest growing religious group in America has been the NONES: those who might be interested, but claim NO religious affiliation. It’s staggering to read descriptions of these NONES. This data is from 2012, so it’s already dated. But in 2012, 33 million people in the U.S.A. claimed they have no religious affiliation in particular. Yet, two-thirds of them say they believe in God, more than half of them say they often feel a deep connection with nature and the earth, and one-in-five of them say they pray every day (www.pewforum.org/2012/10/09/nones-on-the-rise). We’re failing them. We’re failing God if we’re not even willing to try. . . . Everywhere we turn we can see people living in the shallow end of life driven by anxiety because they’re listening more to the whims of our consumer culture than the Spirit of God that is dying to be alive in them. They’re not worried about eternity; they want to know how this Christ, whom we claim to follow, has made any compelling difference in our lives today so that our lives look any different than theirs. How is Christ the rudder that guides our thoughts, words, and deeds every day? How has he given purpose to the way we live and the way we face our death? . . . We can bemoan the changes we’ve experienced in this world, or we can see it as the opportunity for us to become fully alive regarding God’s work in each one of our lives. For now, surrounded by those who desperately need the good news of the God who brings life out of every death and lives in us each day; we have the opportunity to show in word and deed just what it is that we believe. Just what it is that puts peace in our souls and joy in our hearts. We have the chance to become again the disciples of Christ who are sent out into this world for the sake of Life! Truly to be the church heartily living the mission of God each day! A benediction response I love sums it up this way: “sent out in Jesus’ name, (may) our hands (be) ready now to make the earth the place in which the kingdom comes. The angels cannot change a world of hurt and pain into a world of love, of justice and of peace. The task is ours to do, to set it really free. O help us to obey and carry out Christ’s will” (Sent Out in Jesus’ Name, ENVIADO, Anon. ; trans. by Jorge Maldonado; 1996 © Abingdon Press). This entry was posted in Sermons and tagged 15 July 2018 sermon, Living like Christ, Mark 6:6b-16, NONES, Sent Out, Sent Out in Jesus' Name, Talking about Beliefs, Testimony, Witness in World on July 23, 2018 by RevJule. A reading from the gospel of Mark 6:1-6a. Listen for God’s word to us. Who do you call when your air conditioning goes out on the hottest day of summer – as mine did this week? An HVAC technician, right?! Where do you turn for help with a pain in your chest that squeezes tighter and tighter and tighter? If not the ER, then at least your doctor! What if you have quandaries about the Divine? You might expect a pastor would be your best bet or an older, wiser friend in the faith. . . . Whether we realize it or not, we live according to a lot of assumptions. We suppose particular people are best suited to help us with certain things. We wouldn’t want a lawyer doing our open-heart surgery. Or a plumber pulling our teeth. How about a carpenter opening us to the mysteries of God? It doesn’t quite fit with our expectations of the expertise required. But sometimes the most unlikely of candidates can turn out to be the exact ones needed. Early in my ministry when we were having a baptism in worship, sweet little Caitlin was being brought. And man did that kid have lungs! From the moment her parents got her from the nursery to be baptized until the moment they took her back out, that child was NOT happy! She screamed throughout her entire baptism. During the sacrament, we did all the usuals – including asking members of the congregation “do you promise to nurture this child in the faith?” In that church, all the children were gathered up front for baptisms so we asked them to make promises too. We questioned the peering children: “Do you promise to be good church friends, loving Caitlin, and teaching her about Jesus?” . . . Well you know how it is when questions like that get asked in worship rituals. We say aloud the words printed in the bulletin whether or not we whole-heartedly commit to nurturing the children of God. The baptism proceeded. Still screaming, baby Caitlin was handed over. The water trickled down her brow. The prayer, the blessing, Amen. Caitlin’s parents and all the church’s children were released from the font. . . . Each week in that congregation, children didn’t stay in the sanctuary for the rest of worship but went to their own children’s worship in a classroom. When the baptism ended, a stampede of about twenty three through eight year-olds was underway. I went along, trying to wrangle the running children. Outside the sanctuary door, I nearly knocked into 8 year-old Christopher. He stood motionless, his back to me. Heading down the hall, I instructed, “Come on, buddy, let’s go.” He didn’t move. “Christopher, come on,” I insisted. Still no response. I finally returned to where he stood, face to face with him. His eyes were closed – nothing. I stood there in front of him for a moment, preparing myself to have to handle some sort of excuse about why he didn’t want to go to Children’s Worship that day. At last his eyes popped opened. I asked: “Christopher, are you okay? It’s time to go to Children’s Worship.” By that time, he and I were the only ones left in the hallway. He finally said: “I know. I was just saying a prayer for that little baby. She was crying so much I thought she needed a prayer right now.” . . . And a little child shall lead them, Isaiah records. . . . No sooner did Christopher tell me what he was up to, than he took off to Children’s Worship. Meanwhile, I was left standing astonished by his instantaneous commitment to baby Caitlin. He definitely took his “I do” seriously! In my haste to smoothly chorale all the kids back to their classroom, I nearly missed it. I wasn’t expecting such profound wisdom from one so fresh in the faith. That’s kinda how it was another day long, long ago when folks had gathered for worship in Nazareth. It was Sabbath rest in the synagogue. Perhaps they were hoping the rabbi would have a reviving lesson that day. But they didn’t quite get what they were expecting. Instead their neighbor, Jesus, got up. We have to remember that they knew him well: the little boy who grew up down the street. Mary and Joseph’s kid – the eldest of their clan. According to the gospel of Mark, they were five boys and who can remember the scads of sisters. Certainly, visions of the boy Jesus playing with other neighborhood children ran through the worshipers’ minds. Some remembered the time the child got lost on the trip back from Jerusalem. And likely other memories from Jesus’ childhood, his teens, and his twenties before the day Jesus went off the deep end. Everyone back in Jesus’ hometown knew that not long ago, he ran out on the family. Left his carpentry work to meet up with that rabble-rousing John the Baptist. Out yonder in the wilderness John was stirring up a heap of trouble. Proclaiming folks needed to repent for sins to be forgiven. Even though they all knew that wasn’t the way sins got cleansed! The gathered synagogue-goers knew that the Jerusalem priests make their sacrifices. Their take on the situation was that Jesus had gotten messed up with that John guy and the next thing you know, he too was out shouting all sorts of stuff. Like the kingdom of God being near. Jesus had become a disgrace to his family – not to mention an embarrassment to his hometown, because, you know, no one wants to get on the map as the generators of the latest lunatic! Those in the synagogue that day believed that Jesus had denounced his family that time they tried to take him home – away from crowds that believed he had gone mad. He said his mother and brothers were the ones gathered with him – the ones doing the will of God (Mark 3:34-35). Now here he was back in town. Joining in Sabbath worship. Yet, it wasn’t just some announcement about the up-coming mission project that he stood to make that day. Rather, this lowly, un-trained carpenter got up to unlock ancient mysteries about God. Indeed, no one expected that! After all, assumptions about who does and who doesn’t know what run pretty deep. If some completely unqualified handyman gets up to start teaching something new about God – something never before named – something revolutionary, like say a kingdom in which all the tables are over-turned. Power, prestige, and privilege completely reversed! Well, we might not be too keen on listening either. . . . Homeboy Jesus doesn’t fit their expectations. So they shoo him off center stage. How often do we do it? How often do we miss the marvelous lessons of God because our minds already are made up? We can’t imagine anything good coming from that kind. So, instead of listening, we walk away. Mumbling, “what do they know anyway?” We keep ourselves comfortably in our pre-conceived worlds. Not having to stretch too far. Not opening ourselves to something different. Because it’s scary, and it’s challenging, and to be honest: too often, we’re too tired to try. . . . But faith requires openness. Did you catch the chilling words at the close of the reading we heard today? What a shame it would be if those words from Jesus ever found themselves pointed in our direction. Mark 6:6a reads: “And he was amazed at their unbelief.” In fact, the gospel records that due to their unbelief, Jesus “could do no deed of power there” (Mark 6:5). Human beings have rebelled against the unexpected since the beginning of time. All the while, at least according to what we learn from Scripture and from our own lives too if we’re paying attention; all the while, God has been using the unexpected to do the most marvelous of things. From Father Abraham and barren Mother Sarah, to the scoundrel Jacob who becomes Israel, to that little exiled nation, to a child miraculously born to a betrothed young lady, to first followers who were totally unqualified in the eyes of the world. Right down through history to you and me: regular ole’ people who come together to worship the God whom Jesus embodies. . . . The double-edged, good news for us is that God does use the most unlikely of candidates. The Apostle Paul once reminded that it’s the best way to see the unleashed power beyond us: the strength of God, who always makes something out of what seems to be nothing. Who turns death into new life. And makes a way where there seems to be none. For our part: we’re asked to believe. Which isn’t about accent to a certain set of facts. We’re called to believe. To trust. To keep ourselves open to God. For then, we just might have the eyes to see and the ears to hear the marvels of the God who works beyond all our ingrained expectations. Changing the world of our lives one powerful deed at a time! This entry was posted in Sermons and tagged 8 July 2018 sermon, Baptism, Expectations, Faith, Mark 6:1-6a, Nazareth, Openness, unbelief on July 23, 2018 by RevJule. A reading from the gospel of Mark 5:21-43. Listen for God’s word to us as we continue our way through the gospel of Mark’s version of the life and ministry of Jesus, the Christ. Listen. This week, Jesus is back in the boat. Returning from deliberately crossing to the other side of the Sea of Galilee. If we remember that the boat has been a symbol of the Church since the earliest days of Christianity, then our ears perk as we hear Mark’s record that Jesus is back in the boat. Take note: what’s about to take place is what happens when Christ is amid the Church. No sooner does the bow of the boat touch shore, than an important leader of the synagogue throws himself at Jesus’ feet. His little girl is dying. Jairus is desperate. With so much pain around us in the world. So many ways we are inflicting physical, emotional, mental, and spiritual dis-ease on one another today, the stories from Mark’s gospel about a healing story within a healing story come at just the right time. Not only must we remember that healing happens, but it’s also a good time to remember how healing takes place today. Likely you know that healing is a complex thing. It doesn’t happen according to our expectations. We tend to be quite focused on fixes. Thinking God is more like a skilled surgeon who can cut out what we don’t want before sewing things up good as new. One commentator of Mark’s fifth chapter writes: “I have a friend, a man of deep faith, who was diagnosed with Parkinson’s disease when he was still in his fifties. He and his wife prayed that he might be healed. Twenty years later, he is in the last debilitating stages of the disease.” The commentator goes on to write: “Nevertheless, (my friend) once told me that his prayers had been answered. He said in all sincerity, ‘I have been healed, not of Parkinson’s disease, but I have been healed of my fear of Parkinson’s disease’” (Michael L. Lindvall, Feasting on the Word, Year B. Vol. 3; pp. 188, 190). What a wonderful reminder that healing does happen. Just not always as we might expect! Healing doesn’t happen on our time schedule either. While it’s true that healing can happen instantly as it did for the hemorrhaging woman when she stole a touch of the Master Healer’s cloak. Full healing can take a very long time. After all, it was 12 years that the woman who was hemorrhaging sought healing before the miraculous moment with Jesus finally took place. Healing can feel elusive all a life long. Recently a friend told me that in prayer a few weeks ago, she heard the voice of her father. She gave me permission to share her experience today. I knew my friend’s father had died several years ago, so it was quite a shock to hear her explain how she unexpectedly heard him say: “I’m sorry for everything I’ve done.” My 70-year-old friend has been trying for about the past fifty years to heal from the deep wound caused by her father’s molestation of her during her childhood. As she told me of the freedom she finally felt after his words came to her out of nowhere during those moments of prayer, I noted the date it happened was Fathers’ Day, just a few weeks ago. It’s a sure reminder that healing comes in many forms. And just when you think it’ll never happen, a voice in a prayer might be all it’ll take. Indeed, healing is incredibly inexplicable! It’s important for us to remember too that healing happens through us. On Tuesday this week, I was surprised to be so inspired at a called Presbytery meeting. A young woman of Northern Ireland who is being ordained by us as a chaplain for a local women’s addiction recovery center was asked what wisdom she could bring to our land from her experience of being raised in a country where Roman Catholics and Protestants long had been in a bitter, violent divide. Eloquently she told the story of her father, who is a police officer and life-long Presbyterian. She explained that she didn’t know that checking under your car before getting in it wasn’t something every other child in the world grew up doing. But because her father was a police officer and the militant IRA often used to target crimes against police and their families, it was a regular part of her childhood. She told that she didn’t know all the solutions to ancient divides between people because of religion, race, or any other reason we are encouraged by power to keep ourselves separated from those we perceive to be different. What she did know was the devoted friendship of her father’s police partner: a Catholic man who served alongside him most all of his adult life. As a child she watched her Presbyterian Protestant father and her father’s Catholic police force partner daily have each other’s back. Getting to know one another’s fears, hopes, and heartbreaks as they spent hours together on patrol. Building a relationship of trust despite the outer pressures of their land that sought to tear them apart. Connection like that with another – especially those we perceive to be different than ourselves was the wisdom she shared with us this week. For that’s how healing happens. Bringing us back together in the bonds of common humanity no matter what other labels we might wear. I’ve heard of healing happening when at last one speaks their truth. Sometimes received immediately with grace. Sometimes forcing another finally to face their buried pain. I’ve heard of healing happening when the insular bubble in which one has been living at last is broken. New options visible. Fresh vistas unfolding like a magic road appearing below one’s feet. I’ve seen long-held family difficulties carried differently so that others’ pain is tenderly acknowledged too. I’ve seen people learn to live from the disease of cancer – a dear friend beating the odds after surgical removal by seeking natural alternatives to follow up treatments. She’s now the most vibrant, health-conscious person I’ve ever met. I know of people who seem to heal a little bit at a time – like layers being peeled from an onion. Some days better than others. And just when they thought it was finished, a little bit more is released. I’ve seen people healed not just in body, but in mind and spirit too after near fatal accidents. Sometimes thanks to modern medicine and sometimes from treatments as old as the earth itself. I’ve seen people have no idea how they will get through until day after day, carefully putting one foot in front of the other, wincing every so often when the wound again aches; until at last they find a new stride – one of deeper wisdom and greater grace for others. Healing happens. Mysteriously in ways we can’t ever anticipate. And I think about Jairus’ twelve-year-old daughter. Can you image the life she went on to lead after that day when her father begged Jesus to help? It’s been written that “this little girl was raised from death to become a woman. It was not yet the final victory. She was raised to die again. But she could live as one that knew death would not have the last word” (Allen Verhey, Feasting on the Gospels: Mark, p. 156). Healed, she became God’s vessel of hope for a deeply wounded world. After all, that’s how healing happens. One person after another. In ways we’d rarely expect. No matter how long it takes. Until at last all peoples are free. All divisions at their end. Every tear wiped away as mourning gives way to dancing. Today, tomorrow, and forever. May it ever be. This entry was posted in Sermons and tagged 1 July 2018 sermon, Death and Resurrection, Healing, Jairus, Mark 5:21-43, Northern Ireland, Pain, Prayer, Touch on July 3, 2018 by RevJule.